The City of Paris and the RATP Group, the state-owned public transport operator that runs the Paris Métro subway, have jointly launched Les Deux Rives, a bold initiative to build the world’s greenest business district. Les Deux Rives ("the Two Banks") designates the dense area in the heart of Paris between Lyon and Austerlitz train stations and the neighbourhoods of Bercy and Tolbiac. Divided in two by the river Seine, Les Deux Rives is the city's fourth largest business district, with 700 companies that employ 100,000 people. Les Deux Rives aims to become the first "circular district" in Paris, operating by the principles of the circular economy. It will enable companies to share equipment and services, and recycle and upcycle waste in a synergistic way. In its current pilot stage, 30 companies and public sector organizations, such as Mairie de Paris, RATP, Natixis, the Ministry of Interior, Hôtel Pullman and Caisse des Dépôts, are working together on three key initiatives: reducing disposable food packaging, aggregating carpool services, and collectively managing waste. Les Deux Rives project is anchored by a digital collaboration platform that allows large companies, entrepreneurs, NGOs, citizen groups and policy-makers to share best practices and co-create solutions. Home to Station F, the world’s largest start-up campus, the district is emerging as a breeding ground for socially conscious Gen Y and Z entrepreneurs, eager to use their talent to co-build equitable, healthy and sustainable communities. Led by visionary mayors and governors, such as Anne Hidalgo in Paris and Jerry Brown in California, cities and regions across the world are taking the lead in fighting climate change. Hidalgo chairs the C40 Cities Climate Leadership Group, which connects more than 90 of the world’s megacities committed to tackling the climate crisis. Jerry Brown, who recently hosted the Global Climate Action Summit in San Francisco, has signed a bill to transition California to 100% zero-carbon electricity by 2045. In this context, Les Deux Rives offers valuable lessons for regional and city-level policy-makers who want to integrate economic development, social inclusion and sustainability. In July 2017, the Paris City Council unveiled a roadmap to transition the City of Light to a circular economy. The roadmap was devised with input from 240 players from the private sector, civil society and academia. 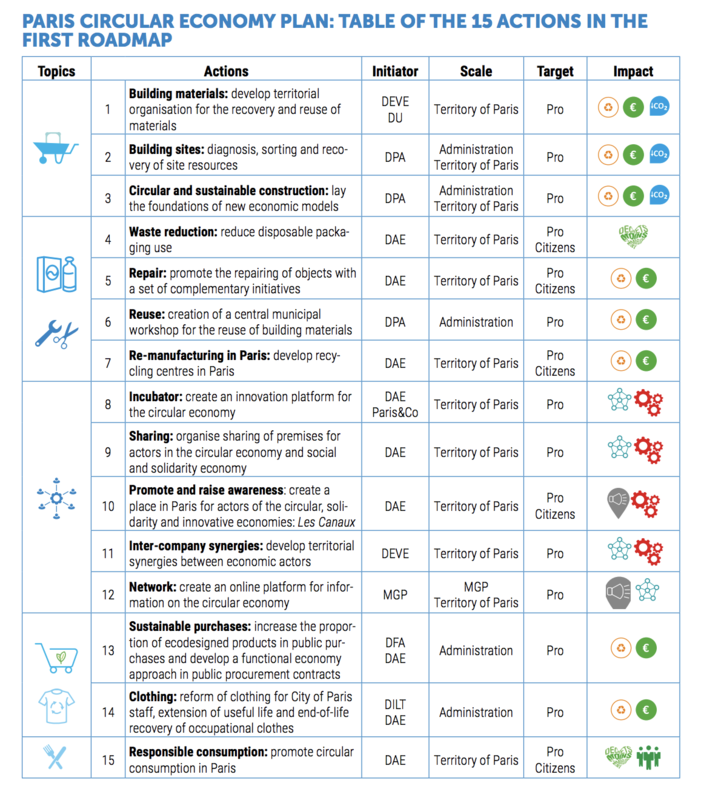 It identifies 15 practical action items, including Les Deux Rives, to enable sustainable production and consumption, and eliminate waste in Paris by 2020. The city council will oversee the implementation of these 15 work streams in close partnership with businesses, NGOs and citizen groups. What can other city councils learn from this? They must use an "open innovation" approach and involve all stakeholders in the deliberation, design and implementation of their city’s sustainability strategy to boost its legitimacy and acceptance. Les Deux Rives is the flagship initiative in the French capital’s circular economy master plan. When the stakes are so high, it’s imperative that cities - and their private sector and civil society partners - assign strong leaders to carry out strategic pilot projects. Les Deux Rives is co-directed by two outstanding women leaders: Antoinette Guhl, deputy mayor of Paris in charge of social enterprise, social innovation and the circular economy, and Marie-Claude Dupuis, head of strategy and innovation at RATP, the state-owned public transport operator. Guhl and Dupuis both boast diplomatic skills and an entrepreneurial spirit, and have deep experience leading large-scale projects and coordinating multi-stakeholder alliances. Today, the circular economy is focused on reusing resources and recycling waste. This generates greater efficiencies in a capitalist economy, but it doesn’t address pervasive social inequality. Les Deux Rives wants to change this. It wants to ensure that every recycling activity in its district also generates social value for underprivileged citizens, evolving the circular economy into a virtuous "spiral" economy. For example, Le Petit Bain, a floating cultural venue moored on the river Seine, gives its used beverage delivery pallets to 13 Avenir, an NGO that fights long-term unemployment. 13 Avenir upcycles these old pallets into beautiful tables and chairs with help from the long-term unemployed (13 Avenir hires them full-time with a job guarantee) and sells them back to Le Petit Bain for use in its terrace. Today, the sharing economy is limited to consumer-to-consumer (C2C) transactions, such as citizens directly sharing cars and apartments. But as Les Deux Rives demonstrates, business districts, with their high concentration of enterprises, can pioneer business-to-business (B2B) sharing, enabling nearby firms to share resources, ranging from waste and unused office space to employees and even intellectual property (IP). The C2C sharing economy is expected to grow from $15 billion in 2014 to $335 billion by 2025. But cities could unleash and harness trillions of dollars in potential economic value by spurring B2B sharing among companies in their business districts. City councils need to create a comprehensive new framework, covering legal liability, taxation, IP protection and workers’ rights, to incentivise companies to share assets, personnel and IP. Silicon Valley, with its rampant sexism and elitist innovation culture (do you fancy a $700 Wi-fi connected juicer? ), is losing its appeal among socially and ecologically conscious Gen Y and Z entrepreneurs, who are moving to greener pastures (literally). These young innovators aren’t interested in sending a sports car to Mars; rather, they want to use their talent and energy to preserve our planet and build inclusive, fair and healthy communities. When I visited Les Deux Rives, I met several Gen Z graduates from top French engineering and business schools who had turned down job offers from big banks and consulting firms, and had instead launched start-ups that offer services to build a circular economy. By adopting a bold sustainability strategy as Paris did, cities could attract a new breed of conscious entrepreneurs with business minds, social hearts and ecological souls to invigorate the local economy, strengthen social bonds and help reverse climate change. By 2050, nearly 70% of the world population will be living in urban areas. Cities must take the global lead in fighting - and reversing - climate change. Les Deux Rives offers key insights and practical lessons to city policy-makers on how to engage the private sector and civil society to co-build socially inclusive and ecologically sound neighbourhoods. In such sustainable communities, to quote the motto of Les Deux Rives, "nothing is lost and everything is transformed".